Numbats are one of the more beautiful and strikingly marked Australian mammals. Morphologically similar to the dasyurids, they are quadrupedal, place the heel of the hind foot on the ground when standing, and the snout is elongated and sharply pointed. Unique features of numbats include a very long tail, almost equal to the head and body length, and ears that are furred, erect, and quite narrow. 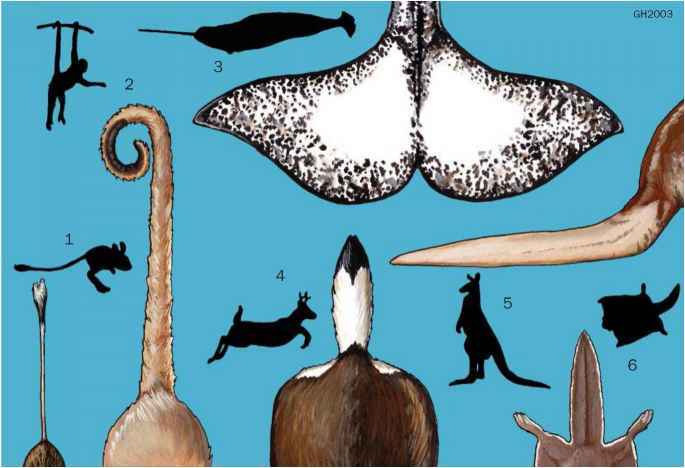 Numbats also have more teeth than dasyurids; with five structurally simple molar teeth lacking defined cusps. Males and females are a similar size (1-1.1 lb; 0.45-0.5 kg). The medium-length soft fur is reddish brown in color, darker towards the rump and paler below, with five to six transverse white stripes across the lower back and a white-bordered black stripe running from the snout to the base of the ear. Tail hairs are long and often erect. The female has four teats surrounded by crimped hair on the lower abdomen but there is no visible pouch. The very long, thin tongue can protrude several inches/centimeters beyond the end of the snout when feeding.